Color is a powerful tool for Reiki sessions that can be used to energize the aura with specific healing vibrations. This technique utilizes the energetic qualities of the chakras and their Planetary and Astrological correspondences to effectively transform the aura, raising or lowering its vibration for different intents. Moon: Emotions, subconscious, dreams, personality. Color: White. Mercury: Communication (speech, writing), thinking. Color: Silver. Venus: Passion, desire, love, pleasure. Color: Green. Mars: Energy, immune system, anger, strength. Color: Red. Select the type of vibration that is required for the work at hand. For example, if the patient has a persistent feeling of lethargy, you may find that working with the energy of the Sun would help bring them newfound vitality and healing. If a patient were experience bad dreams, you could work with the Moon since it governs dreams and the subconscious, and so on. The technique is simple to incorporate into a standard Reiki healing session, or as an adjunct after the regular session. 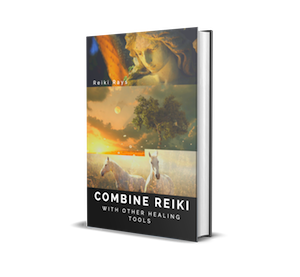 After connecting with Reiki energy, use Cho Ku Rei to turn up the current. Take in a deep, cleansing breath, and exhale slowly, relaxing. As you do so, see your breath turning the color of the planetary influence you wish to work with. For example, if the Sun, see your breath turning a bright warm golden yellow. With each successive breath, your aura fills with this radiance, until you are surrounded by a sphere of the visualized color. Each inhalation brings in more of the color, and each exhalation, the color flows out, forming a brilliant cloud of vibrating light. If you are performing a self-healing, simply sit quietly in this light for 3 – 5 minutes, breathing regularly, and watching the dance of colored light. If you can not see the light for any of these steps, simply have the intent that it is present and know that it is there. If you are performing Reiki on another, you can now project the colored light onto the person with each exhalation. You might find that again using Cho Ku Rei will help to amplify the effect, so that the vibrations in the appropriate color light up the patients aura with healing energy. Use the other Reiki symbols as your intuition dictates. For example, Sei Hei Ki works very well with white Lunar light to help ease mental discomfort or worry. This technique can also be used to change the atmosphere of a room. Have you ever walked into a very tense meeting perhaps? Breathing out the healing vibration of Jupiter, a rich purple light, along with Sei He Ki would help to ease tensions. Or maybe a room just feels lifeless and needs to be livened up. Projecting the breath to fill your aura with golden light, while visualizing Cho Ku Rei will immediately transform the room into a warm, inviting place. This is also a good meditative practice that can be included as part of your own healing work. Change the atmosphere of your personal space when meditating in the morning, for example, and see how it influences your day. If you have a special room where you perform Reiki treatments, try changing its vibratory rate before you see clients, to add to the healing, welcoming nature of your practice. If you work with crystals, you can also embed them with the planetary energies. First activate the desired influence in your aura with the appropriate colored breath, and then breathe the color out and into the crystal. Seal this with Cho Ku Rei to have a powerfully energetic tool. Working with the prismatic colors is an easy and effective way to quickly get dramatic and long lasting results. The benefits of this practice are manifold, and the more you work with it the easier and natural it becomes to “breathe color” into yourself and others. Gregory Peters is an Usui Ryoho Reiki Master and Teacher, Esoteric author and traveler. He has over 20 years of experience in Western and Eastern metaphysical systems, and enjoys traveling to sacred sites around the world, exploring spiritual practices from many cultures and traditions.